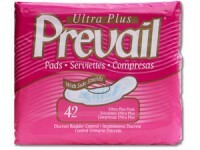 Urinary pads are specially designed to absorb urine leakage. They provide light to moderate protection and are available in different absorbencies depending on their use during the day or night. The urinary pad that you choose should provide ultimate comfort and security.TENA® Serenity Bladder Control Pads offer a complete line of innovative products that are specifically designed for female incontinence and provide the comfort and discretion you desire. Using unisex pads will help a great deal but using gender specific pads provide for better comfort and protection. The urinary pads are shaped and designed so that the user can resume normal daily activities without becoming self-conscious about the fact that there are pads under their clothing. TENA® Serenity pads conform to the user’s body structure and have a soft top-sheet to wick away moisture. All TENA® Serenity Pads are individually wrapped and contain super absorbent micro-beads. TENA® Serenity Incontinence Pads are 100% latex free and pH balanced with OdaSorb Plus to control odor. 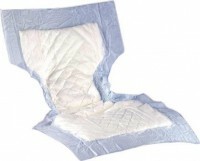 The Dry-Fast-Core fluid locking system in a TENA® Serenity pad is amazing and allows the user to be dry at all times. TENA® Serenity Overnight Pads are designed for overnight wear. TENA® Overnight Pads are uniquely shaped so they are wider at the back and front to protect better when you are lying down. These TENA® Overnight Pads offer advanced absorption technology and a cottony-soft top sheet that keep you dry and comfortable while you sleep. The TENA® Serenity Overnight Pads are the most absorbent female overnight pad that we offer. A new feature of the TENA® Serenity Overnight Pads is that they are infused with more Super absorbent micro-beads. The inclusion of more micro-beads means more absorbency and leak protection. The beads allow moisture to wicked away, fluids to be trapped, and odors to be controlled. The product also has cushiony side gathers that promote a body conscious fit. TENA® Serenity Overnight Pads come in individually wrapped packets for convenience and portability. Contoured shape provides comfort, and fits seamlessly into most body worn disposable products like taped diapers and pull-ups style protective underwear. Kendall® Presence™ Bladder Control Pads. Effective yet discreet protection for light incontinence control, with the look of a feminine hygiene product and the increased capacity of an incontinence product. Features a blue aperture acquisition layer and super-absorbent polymer for maximum fluid retention while reducing odor and keeping wetness away from skin. Features an air laid insert that acts as the pad’s backbone, preventing undesirable deformation during use. Cloth-like facing and latex-free elastic leg gathers for a better fit. Individually sealed with a durable wrapper that doubles as a disposal device. Use with all Dignity® Plus products. Low-profile, super-absorbent liner with adhesive release tape secures in any underwear. “Gels” when wet to lock in wetness. Moisture-proof barrier and soft, non-woven facing provide comfort and protection. Recommended for the management of most bladder loss and light bowel leakage problems. Prevail® Bladder Control Pads are body-shaped pad inserts with Cloth-like Outer Fabric designed for stress and urge incontinence. Featuring the Target Acquisition Zone and the Blue Stay-Dry Strip, liquid is quickly wicked and locked away from the skin for ultimate skin dryness, leakage protection and odor control. With a full-length adhesive strip for secure anchoring, Prevail® Bladder Control Pads offers the ultimate in discretion and protection. For mild to moderate bladder protection. Designed for comfort and protection. Features a polyethylene back sheet and soft, white oval shaped elastics that provide a closer fit. Can be worn with regular underwear. Full length adhesive strip holds pad securely in place. Wetness indicator and latex-free. 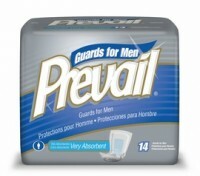 Prevail Male Guard are body-shaped pad inserts made specifically for men. The cloth-like outer fabric designed for stress and urge incontinence. Featuring the Target Acquisition Zone and the Blue Stay-Dry Strip, liquid is quickly wicked and locked away from the skin for ultimate skin dryness, leakage protection and odor control. With a full-length adhesive strip for secure anchoring, Prevail Male Guard bladder control pads offers the ultimate in discretion and protection. Pad Length: 13″. Sold by the case. At Ease® Extra Absorbency Liner With polymer. With wetness indicator and elastic leg gathers. Designed for use as Booster Pad inside other incontinence undergarment. For moderate to heavy protection. Pad size is 4″w x 12″l (folded). Absorbs up to 16 oz. 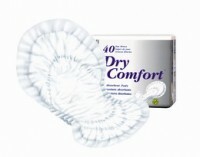 Use with Dignity® garment or regular pants. Double pad made of fluff filling and a soft, non-woven covering. Pad can be cut for single use, or layered for triple protection.